Winter storms may include snow, sleet, freezing rain, or a mix of these wintry forms of precipitation. A winter storm can range from a moderate snowfall or ice event over a period of a few hours to blizzard conditions with wind-driven snow that lasts for several days. Many winter storms are accompanied by low temperatures and heavy and/or blowing snow, which can severely impair visibility and disrupt transportation. They begin as low-pressure systems that move through Pennsylvania usually following the jet stream. Due to their regular occurrence, these storms are considered hazards only when they result in damage to specific structures or cause disruption to traffic, communications, electric power, or other utilities. The snowfall season is November through April, with the greatest monthly snowfalls occurring in March as moisture supply begins to increase with rising temperatures. The Commonwealth of Pennsylvania has a long history of severe winter weather. Six of the 59 Presidential Disaster and Emergency Declarations issued in Pennsylvania have been in response to winter storms. The worst winter storm in the country on record, called the Storm of the Century, occurred on March 11-14, 1993, and stretched from Canada to the Gulf of Mexico but was worst in the Eastern United States, including all of Pennsylvania. Winter storms are a regular, annual occurrence in Pennsylvania and should be considered highly likely. Large snowfall years with frequent and heavier than normal snowfalls have increased in the Northeast (especially with the winters of 2013/2014 and 2014/2015). While there may be more occurrences of intense winter storms, the overall snow cover is expected to decline. The number of snow-covered days declined by 1.5 days per decade for January in the Northeast and snow totals are expected to decline 20-30% in the northern part of the state and 50-60% in southern parts (PA DCNR 2015). 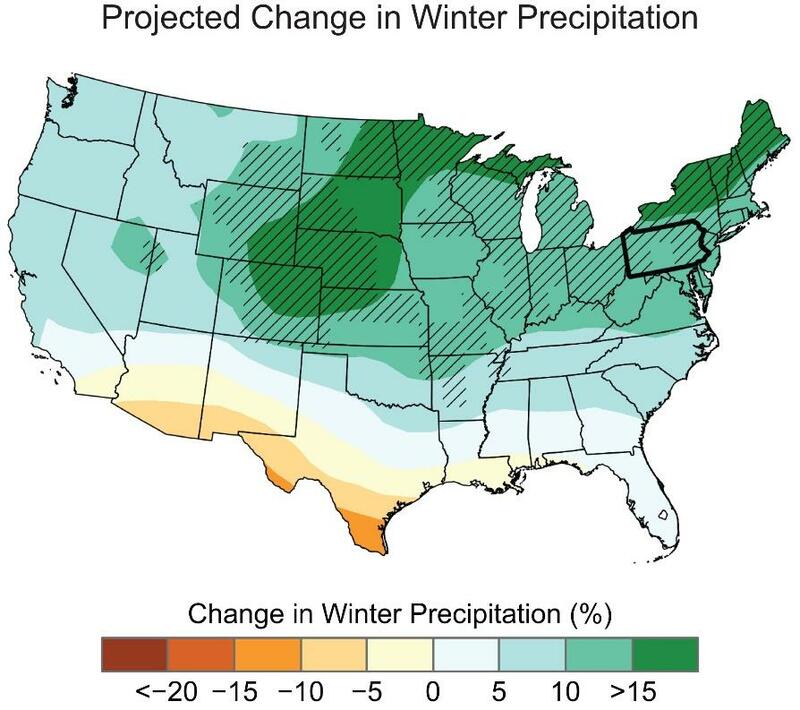 It is possible there will be an increase in frequency and intensity of winter storms, and probable there will be a decline in total snow cover along with an increase in the percentage of precipitation falling as rain instead of snow. To view a printable pdf file of the Natural Hazards Risk Assessment, click here.